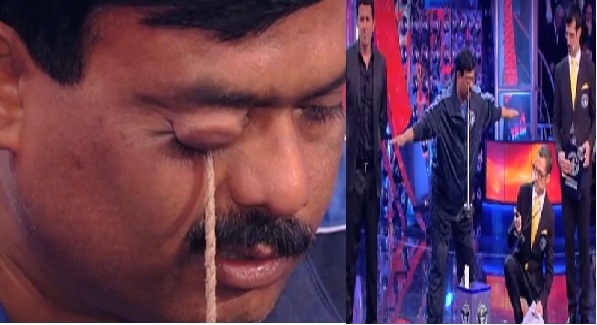 Home » Viral Posts » Watch:He lifted 3kg weight with his eye-lashes!!! Watch:He lifted 3kg weight with his eye-lashes!!! A teacher from Raipur, Dr Satyajit Hota, has set a World record by lifting 3kg weight with his eye-lashes. Participating in the Guinness World Record Ab India Todega, Satyajit is the first person to set a world record in such kind of an act. No one has ever tried this kind of an act before where the participant lifts such a weight with his eye-lashes. ‎Talking to Dainik Bhaskar, Dr Hota said that he used to lift pen and spoons with his eye-lashes when he was a kid. He said, he later increased the weights and started lifting books weighing 3kgs. He said, his students are very happy with his achievement. He has received many messages, congratulating him for his achievement. Even his wife is a teacher of Economics.